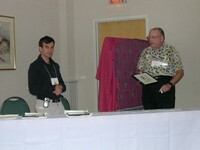 This page is dedicated to photographs of UMA ceremonies and the winners being presented with their awards. 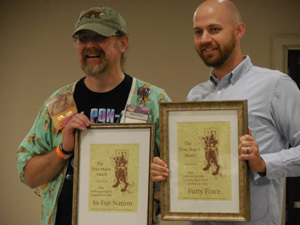 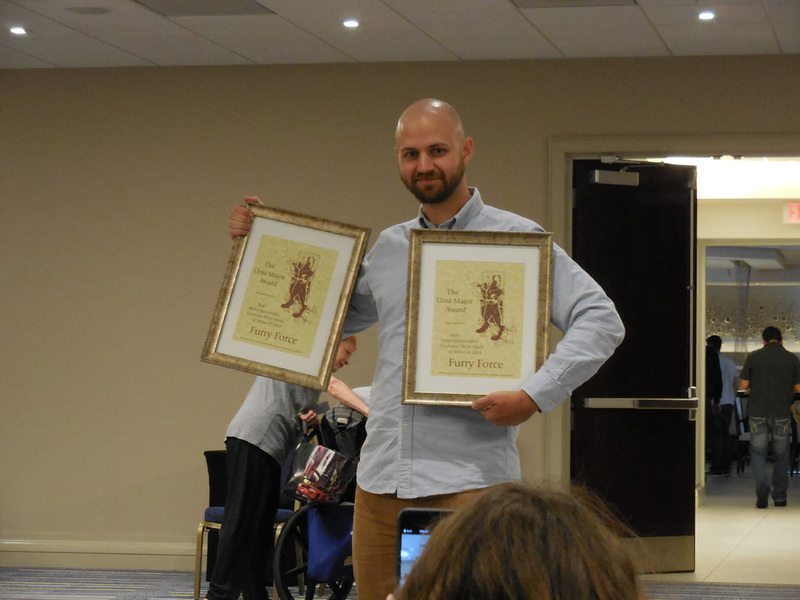 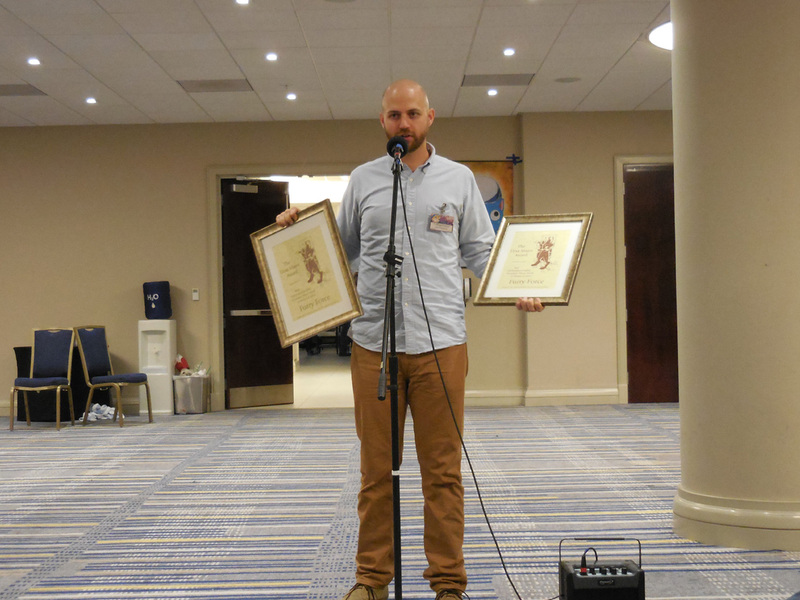 Sam Kirkpatrick (producer and writer for College Humor, co-creator of "Furry Force") and Rod O'Riley (editor, InFurNation.com) accepted their Ursa Major Award Plaques during a brief ceremony at CaliFur.11 in Irvine, California. 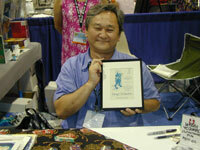 Please click the small images to see the larger versions. The Awards were presented by PeterCat. 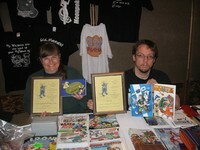 Photos courtesy of Greenreaper. Istanbul accepts the Award for the winner of the Best Anthropomorphic Magazine - "Fuzzy Logic". Bernard Doove - winner of the Best Anthropomorphic Novel for "Flight of the Star Phoenix". D.C.Simpson holds up the Award certificate for Best Anthropomorphic Comic Strip. 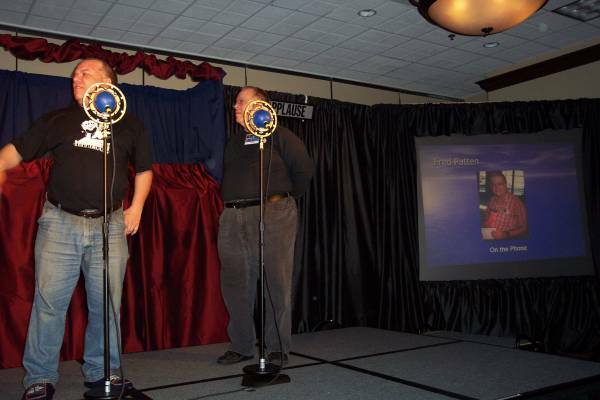 Two of the presenters having a live telephone interview with Fred Patten (shown on screen). 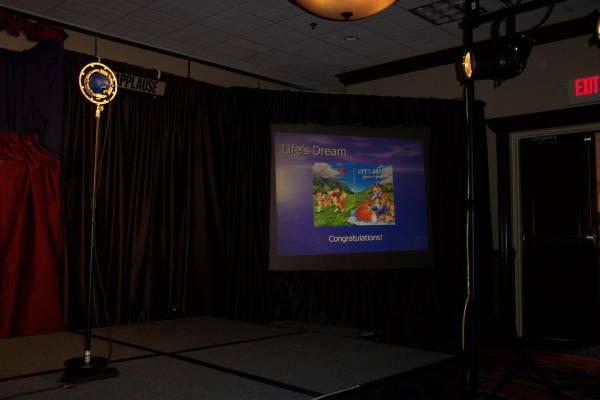 Winner of the Best Anthropomorphic Novel - "Life's Dream" by Bernard Doove. The event was hosted by Glen Wooten, Art Show and Den of Dealers Director for CaliFur. 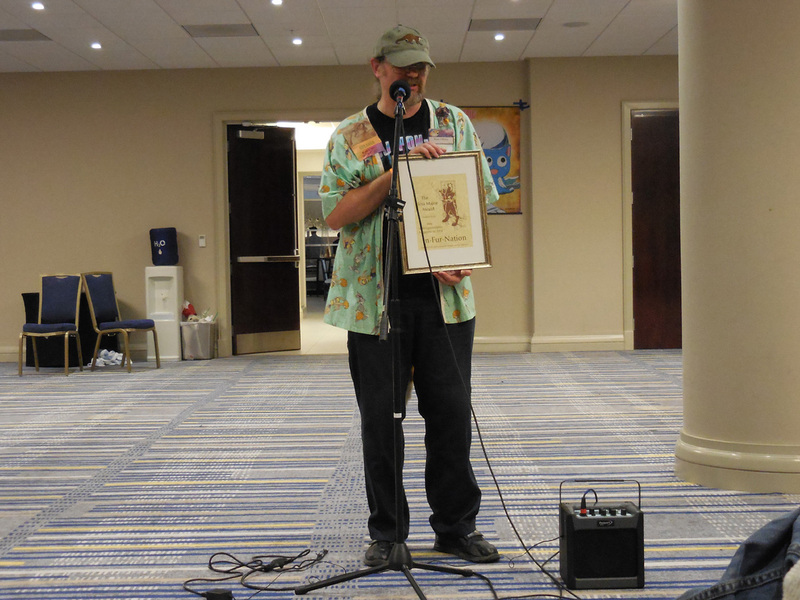 Glen Wooten presents one of the evening's awards to Tim Fay, who was at the ceremony accepting on behalf of Sofawolf Press. 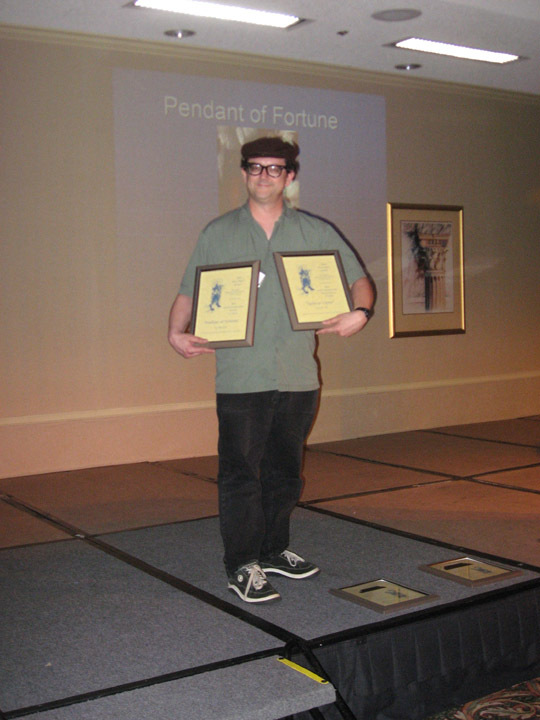 Tim Fay poses with the Ursa Major Awards for Kyell Gold's winning novel (Pendant of Fortune) and short fiction (Jacks to Open). 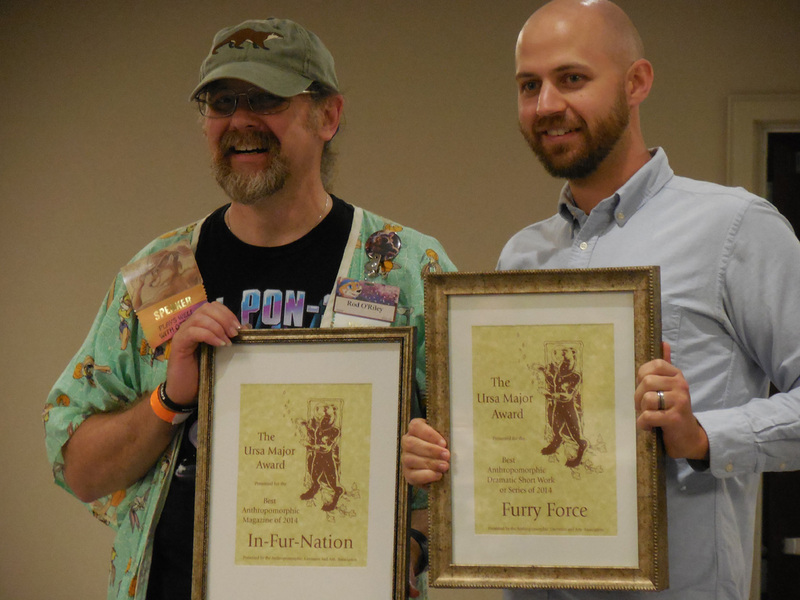 Kerry M. O'Day and Thomas K. Dye, comic book dealers at CaliFur, pose with the Ursa Major Awards for Susan Rankin (A Doemain of our Own -- Best Other Literary Work) and Vince Suzukawa (i.s.o. 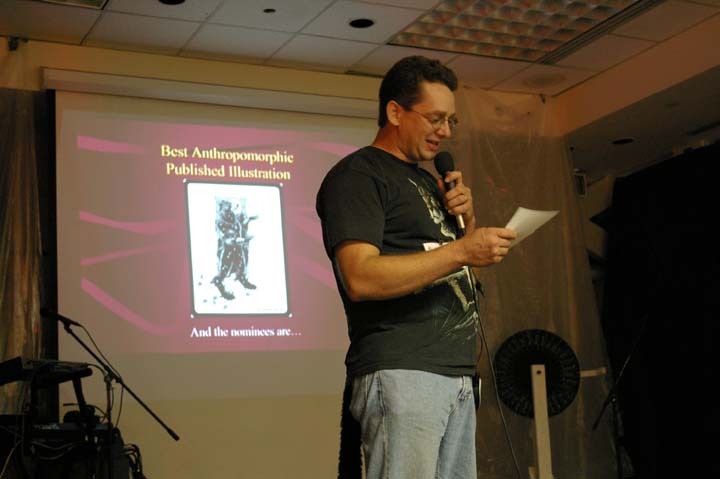 -- Best Comic Book). 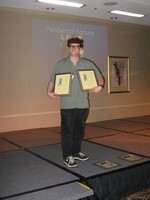 They later helped to deliver the awards. 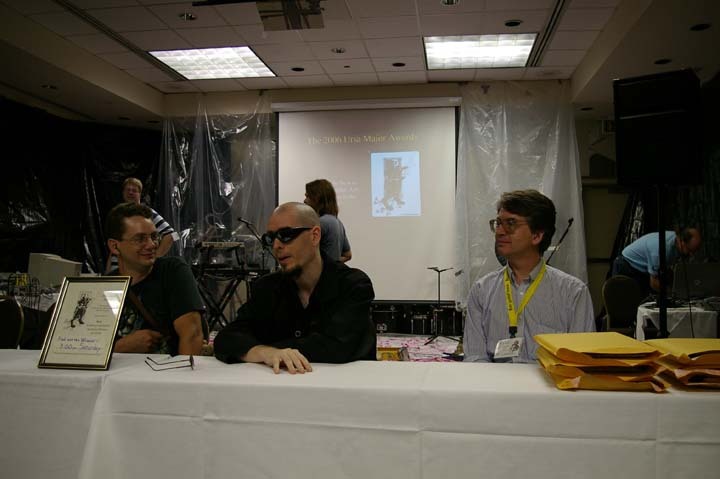 The show was hosted by (left to right): Keven Omel of Rocket City Fur Meet, 2 the Ranting Gryphon, and Ursa Major Award Winner Bill Holbrook ("Kevin & Kell"). 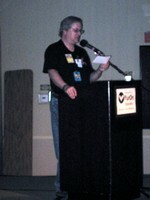 ALAA member Rod O'Riley introduced the show and the hosts, explaining how the voting process works. 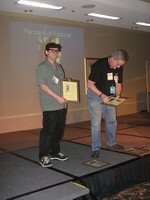 Kevin Omel, also known as KO, presents the award for Best Anthropomorphic Published Illustration. 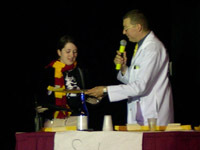 Kacey Miyagami (née Maltzman) receives the 2004 Ursa Major Award for the Best Anthropomorphic Published Illustration from the host of the Awards, Dr Samuel "Uncle Kage" Conway, C.E.O. of Anthrocon at which the presentations were held this year. 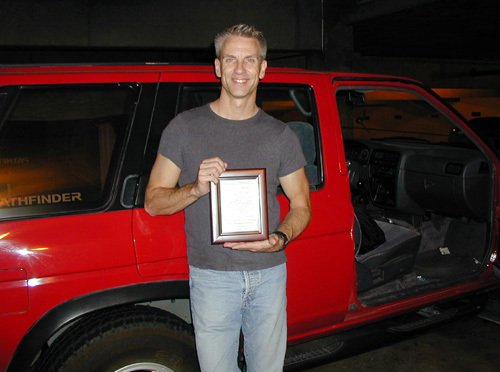 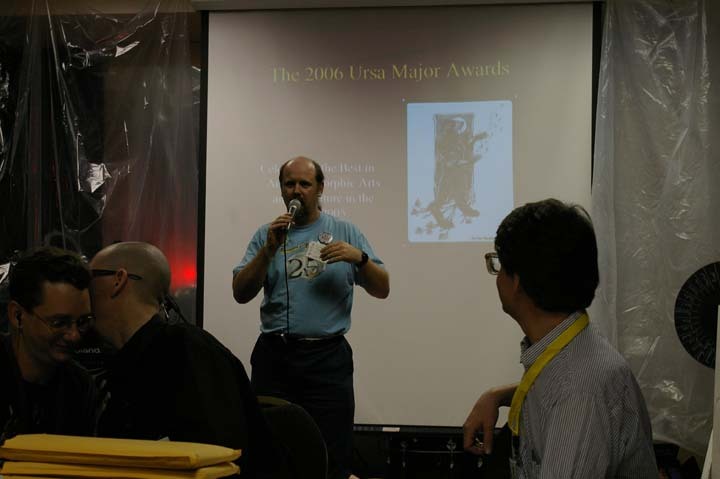 Charles Melville receives the 2004 Ursa Major Award for the Best Anthropomorphic Short Fiction, for his story: Felicia and the Tailcutter's Curse. 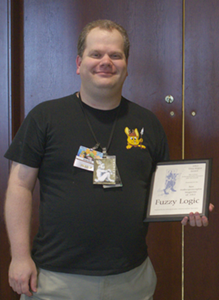 Please click the small images to see the larger versions. 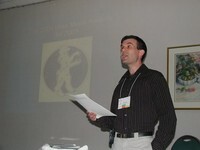 Photos courtesy of Tom Turrittin. 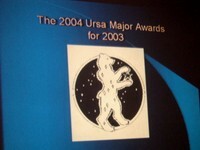 The opening of the 2004 presentations for the 2003 Ursa Major Award. 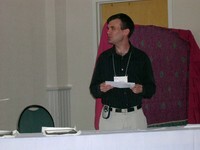 Jeff Novotny, founder of C-ACE, was the host for the Awards. 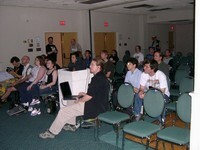 Some of the audience present at the Awards ceremony, including our Powerpoint presentator. 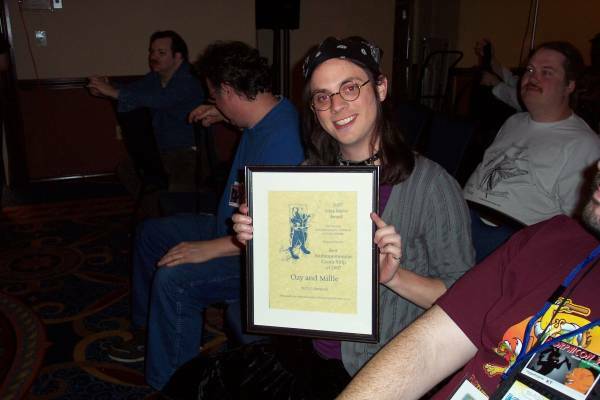 An example of the 2003 Award certificate, with art by Heather Bruton. 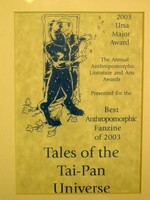 This one was for the winner of the Best Anthropomorphic Fanzine, going to "Tales of the Tai-Pan Universe". 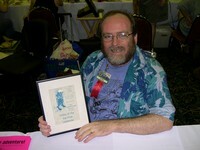 Fred Patten receiving his award for editing "Best in Show", which won Best Anthropomorphic Other Literary Work. 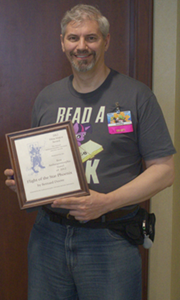 Fred Patten with his Award. 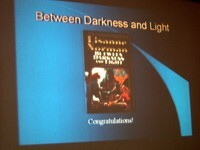 Winner of Best anthropomorphic novel: "Between Darkness and Light", by Lisanne Norman. 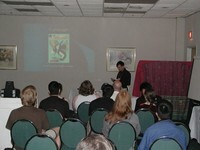 Jeff continues his presentation of the finalists for the Awards. 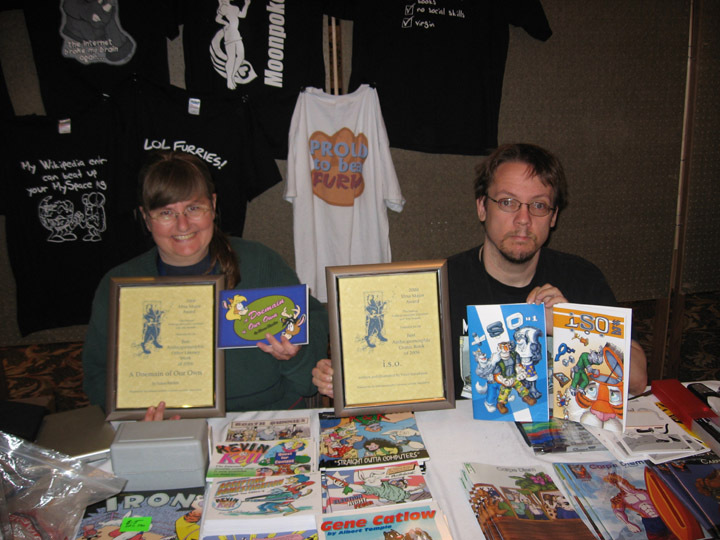 One of the finalists for Best Anthropomorphic Comic Book, in this case Furrlough published by Radio Comix. 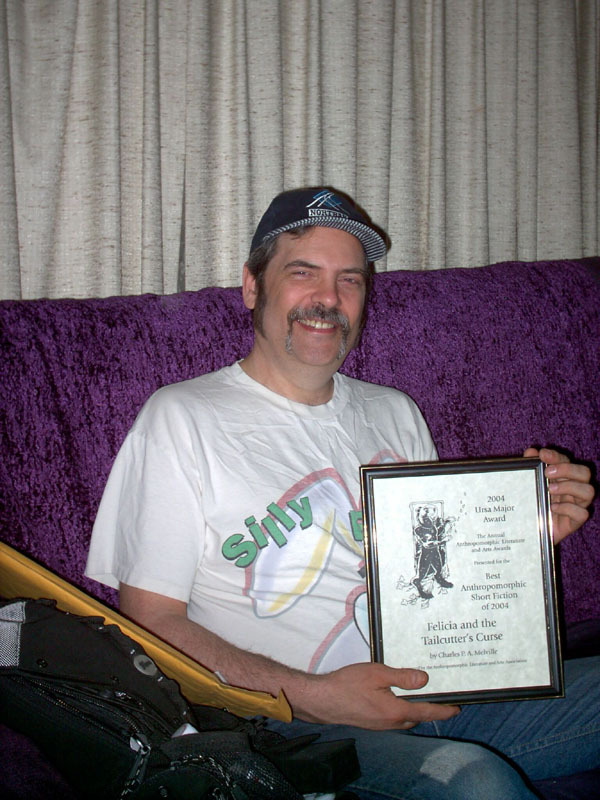 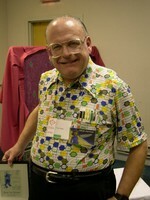 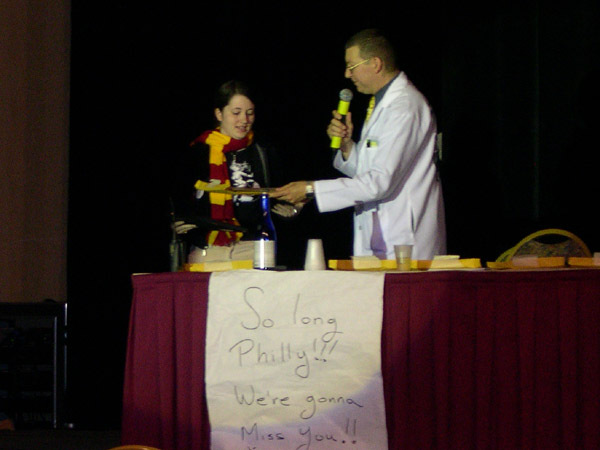 The Award for the winner of the Best Anthropomorphic Fanzine - Tales of the Tai-Pan - is presented to the editor, Gene Breshears, at Anthrocon 2004. Stan Sakai accepts his Award for the Best Anthropomorphic Comic Book of 2003 at the San Diego Comic Con 2004. 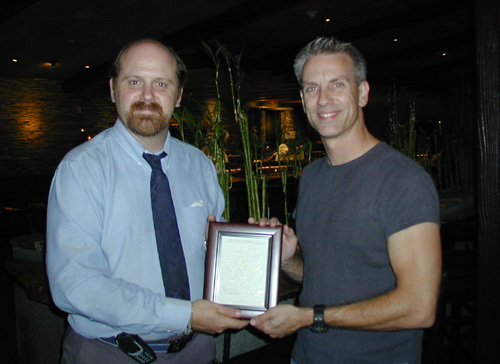 Chris Sanders of Walt Disney Feature Animation, one-half of the directing team behind Disney's "Lilo & Stitch".